Death's head insignia of the Black Brunswicker regiment from Waterloo. 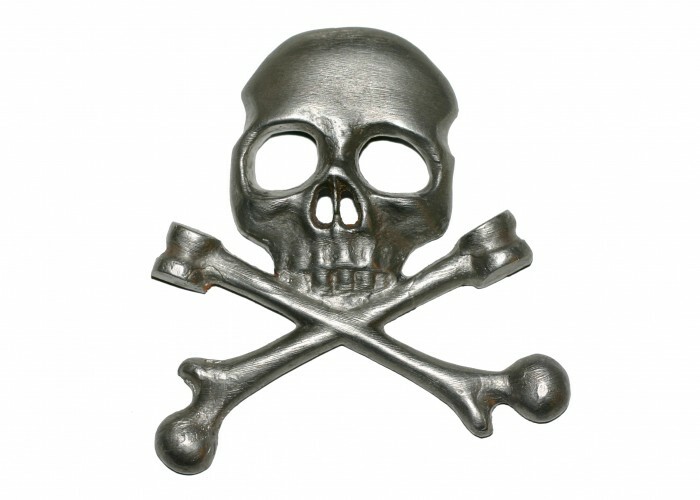 This is a cap badge showing a Totenkopf or Death’s Head, a German symbol of death and warfare. It was worn on the uniform of a soldier in the Black Brunswickers, a German regiment who fought in the Allied army at the Battle of Waterloo. The Brunswickers came from a German state that had been conquered by the French. They wore black uniforms in mourning for their lost country and the death’s head insignia to promise revenge against the French. It was not just the British who fought against the French at the Battle of Waterloo – in fact, of the 68,000 Allied troops who assembled on the morning of 18 June 1815, just 25,000 were British. The rest were a mix of troops from the Netherlands, the diverse King’s German Legion, and several different German states. Another 50,000 Prussian soldiers arrived later in the day to deal the death-blow to Napoleon’s army. At the time of the Battle of Waterloo, Germany was not yet united into a single country, but was made up of many different states. One of these was the Principality of Brunswick-Wolfenbüttel, which had been conquered by the French and was occupied by Napoleon’s forces from 1807 to 1813. The exiled ruler of this state, Duke Frederick William, raised a volunteer force known as the Black Brunswickers, to fight against the French for their lost homeland. Duke Frederick, driven by fanatical anti-French hatred, mortgaged his personal property to raise and equip about 2,300 soldiers. They fought alongside the British in the Peninsular War, and returned triumphantly to Brunswick-Wolfenbüttel when Napoleon was defeated in 1814. When Napoleon returned from exile on Elba in early 1815, the Brunswickers put on their death’s-head caps again, and marched to join the Allied army in the Netherlands and fight the hated French. Duke Frederick was killed on 16 June 1815, at the Battle of Quatre Bras. His troops fought on, surviving to face the French Army at the Battle of Waterloo on 18 June. During the Battle, the Brunswickers began the day in reserve, waiting behind the Allied lines to provide reinforcements wherever needed. They moved up to replace the British Foot Guards, who were sent to guard the farmhouse of Hougoumont, and they faced French cavalry charges and the final attack of the Imperial Guard at the close of the battle.